Santa on Broadway, various times. Santa is stopping by shops along Broadway in downtown Aurora, free. Children can enjoy a visit and pictures with Santa from noon to 3 p.m. at the following locations: Dec. 1, Santa will visit La Quinta de los Reyes, 36 E. New York St.; Dec. 8, Santa will stop by Cinco de Mayo, 102 N. Lake St.; Dec. 15, Santa will be at the soon-to-open Tavern on Broadway, 24 N. Broadway; Dec. 7, Santa will stop by First Fridays from 6 to 9 p.m. and visit PME Cake, 35 N. Broadway. For more information about holiday events in downtown Aurora, visit www.auroradowntown.org. Blackberry Farm Holiday Express, 100 S. Barnes Road, Aurora. The farm celebrates the season with approximately 60,000 glittering lights and festive activities including the presence of Santa and his elves as the decorated train runs continuously around Lake Gregory. The fun begins on Saturday Dec. 1 and 2 from 2 to 7 p.m. Other dates include Friday, Dec. 7 5 to 8 p.m. Saturday and Sunday, Dec. 8 and 9, Friday, Dec. 14 from 5 to 8 p.m., and Saturday and Sunday, Dec. 15 and 16 from 2 to 7 p.m. The cost is $7 per person and tickets are available online through the Fox Valley Park District. 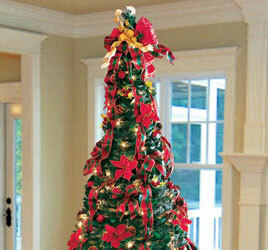 Montgomery Festival of Trees, Village Hall, 200 N. River St., Montgomery, business hours. The festival turns all three levels of the Village Hall into a winter wonderland. Area businesses participate by decorating Christmas trees for everyone to enjoy, and visitors of all ages are invited to vote for their favorite tree. Christmas at Abbey Farms, 2855 Hart Road, Aurora. Join in the tradition of hunting for your very own Abbey-Farms-grown Christmas tree or select a fresh pre-cut fir tree from Father Andrews’ family in upper Michigan. WWhether it’s Christmas trees, the Pine Tree Cafe, the yummy bakery or a tractor ride Abbey Farms is the place to grow memories and traditions. Information: 630-966-7775. Charles Dickens’ A Christmas Carol, Drury Lane Theatre, Oak Brook Terrace. Continue the holiday tradition of gathering the whole family for our heartwarming production of Charles Dickens’ A Christmas Carol, the classic tale of the miserly Ebenezer Scrooge. Information and tickets: 630-530-0111. Christkindlmarket Naperville, Naper Settlement, 523 S. Webster, 11 a.m.-7 p.m., free admission. Experience a traditional German holiday market with the sights, sounds, smells and gifts. The market will feature 40 vendors as well as warm walk-in cabins. German food and imported German beers or gluhwein (hot spiced wine) in collectible souvenir mugs will be sold. Information: christkindlmarket.com/naperville/. Festival of Lights @ Phillips Park, Phillips Park, 1000 Ray Moses Dr., Aurora, free, donations encouraged. One of the largest free outdoor drive-through holiday light displays in Northern Illinois, the Aurora Festival of Lights, returns for its 12th year with even more dazzling displays that will delight both adults and children. Santa will be at the Visitors Center on selected dates and times. Information: 630-256-3750. Cosby Zoo Winter Wonderland, Wheaton. Thousands of twinkling lights, an amazing selection of Christmas trees for purchase, hot chocolate and holiday gifts are featured at the annual Festival of Lights and Tree Sale. Families can also skip the long line at the mall and bring their children to visit Santa at the zoo on Nov. 24, Dec. 1 or Dec. 8. From 10 a.m. to 2 p.m., crafts, refreshments and a visit with the an in red will take place on the second floor of the barn in the Kiebler Room. Zoo admission is free during the Festival of Lights and Tree Sale. Santa’s Craft Corner is $5 per family and $3 for a printed photo with Santa. No registration required. Community Trees, Cantigny Park – Robert R. McCormick House, 1S151 Winfield Road. Wheaton. Seven local non-profits received a donation of $2,500 to decorate a tree and spread the word about their organizations. Vote for your favorite tree! The organization with the most votes by the end of the season will get another donation from the McCormick Foundation. Free admission with parking fee. Information: 630-668-5161. The Second City’s Holiday Revue, Paramount Theatre, 23 E. Galena Blvd., Aurora. Chicago’s famed sketch and improv comedy theater comes back to Aurora with another hilarious take on the holidays. Information: 630-896-6666. Mooseheart Holiday Lights, $10 per vehicle admission. The residential childcare facility, which has served as home for thousands of children and teens in need, will be sparkling this holiday season with more than 80 large lighted holiday displays. Santa Claus will appear on Dec. 8, 9, 15, 16, 22 and 23. Admission fee supports Mooseheart and includes the holiday light show and also a chance to visit with Santa and enjoy crafts, holiday music, hot chocolate and Christmas cookies in the school gymnasium. Festival of Lights, The Promenade Bolingbrook, 631 East Boughton Road. A total of 250,000 LED lights twinkle, sparkle and dance to more than 20 different Holiday songs. Shows on the hour beginning at 5 p.m. Free admission. Information: 630-296-8350. Illumination: Tree Lights at The Morton Arboretum, 4100 Illinois Route 53, Lisle, will transform 50 acres of the Arboretum’s trees to glow in hues of blue, green, purple, and magenta. Along a one-mile path, visitors will experience a set of unique ways to see trees. Tickets are available for specific times, beginning at 4:30 p.m. Admission ends at 8:30 p.m. Tickets range from $7-$23 depending on age, time and Arboretum membership status. The Wizard of Oz, Paramount Theatre, 23 E. Galena Blvd., Aurora. When a twister hits, Dorothy Gale is whisked away to the wonderful world of Oz, a fantastical place full of munchkins, a cowardly lion, a tin man with no heart, a living scarecrow … and a wicked witch that will do whatever it takes to stop Dorothy. Information: 630-896-6666.